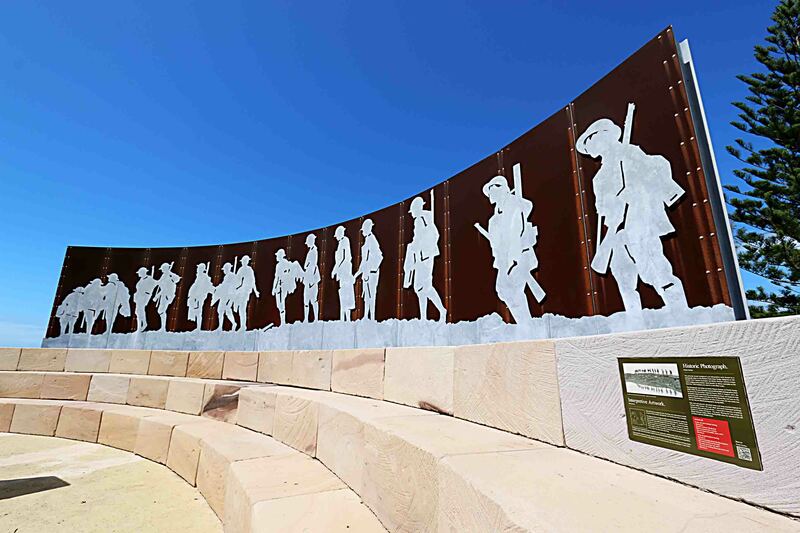 Shady parks and picturesque beaches, sleepy sea side Emu Park is home to the famous Singing Ship Monument & ANZAC Memorial Walk. Emus were a common sight around the coast of Emu Park. You’ll still sometimes spot one if you’re lucky. 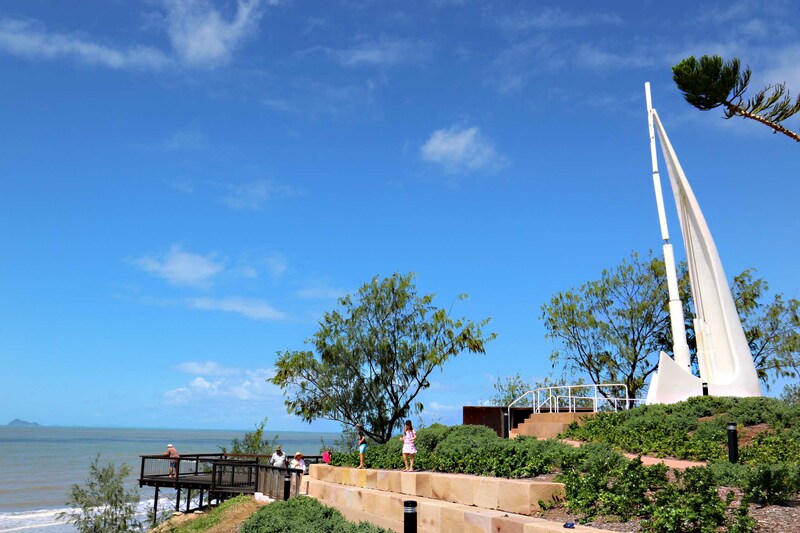 Emu Park, first discovered by Captain James Cook in 1770 (see remarkably beautiful Singing Ship sculpture), overlooks the islands of Keppel Bay, including the Great Keppel Island. 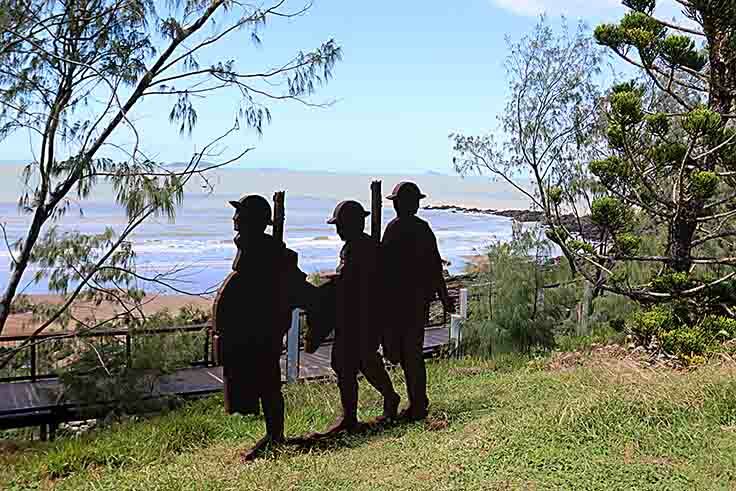 Emu Park is a popular tourist spot, and has won several tourism awards, and features fishing, surfing, boating, unspoiled beaches, and the ANZAC Memorial walk. 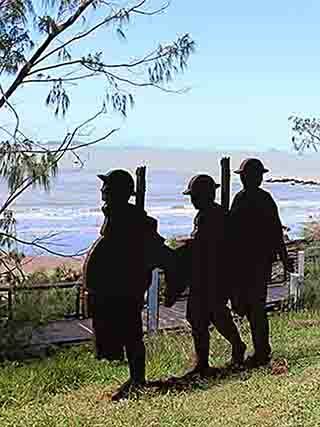 You can find out heaps more on the Emu Park Online site. Bit of history…The place was noticed by three Rockhampton residents while on a fishing trip in the 1860s and recommended itself as a beach spot where Rockhampton inhabitants could escape the inland heat. Despite a local leaseholder, resisting moves by Rockhampton locals, a village reserve and seaside watering place was gazetted in 1869. The Emu Park rail line was opened in 1888 but Emu Park’s role as Rockhampton’s favourite watering place was overshadowed by Yeppoon soon after the railway line to Yeppoon was opened in 1909. It is part of a pleasant scenic drive from Yeppoon heading south along the coast past the Capricorn Coast National Park. 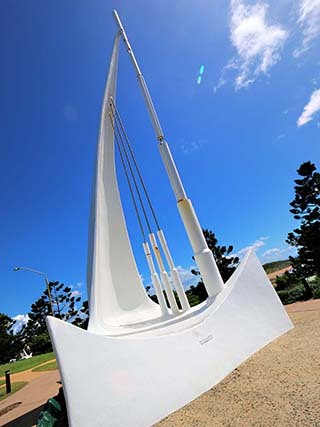 It is known primarily for its views across to Great Keppel Island and its remarkably beautiful Singing Ship sculpture. Emu Park was originally known as Hewittville but when people started holidaying in the area it became known as Emu Park. No one is sure of the origins but, logically, it was probably because there were flocks of emus near the beach and the area behind the beach was park-like. 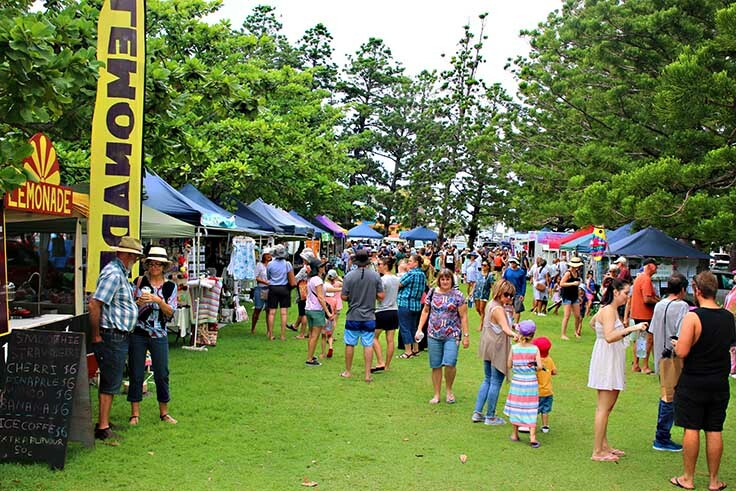 Market days are held on the third Sunday of each month in Bell Park, Emu Parks’ Botanic Gardens. Gazetted in 1899, the Emu Park Botanic Gardens was listed on the Queensland heritage register in 2003. Following the establishment of pathways and seating by the Emu Park Ladies Improvement League, the Reserve became a popular destination for locals and holidaymakers and by the 1940s it was a popular site for large company picnics. Structures within Bell Park include a timber tower thought to be a judges box/starters box, near this structure is a large, open grassed area said to be a runners track; two timber rotundas, one constructed with tree trunks for uprights, while the second rotunda has uprights made from sawn timber. 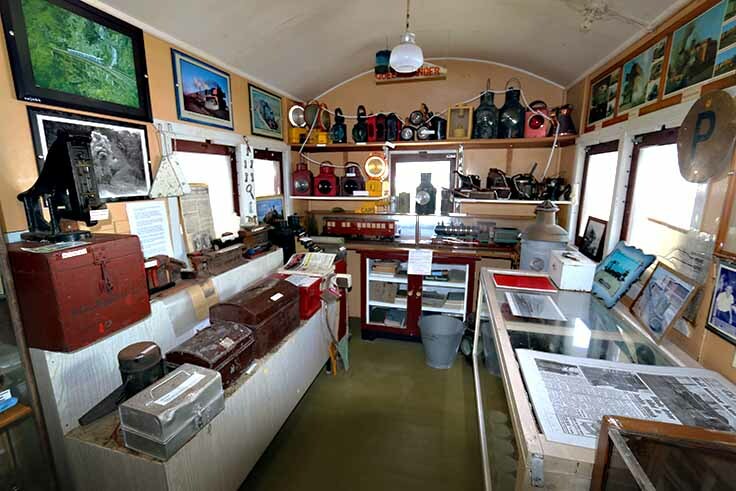 The Emu Park Museum is located at 17 Hill Street and is open weekdays from 10.00 am to 4.00 pm, Saturdays and Sundays from 10.00am to 2.00pm. You can read about it more on our Museums page. Emu Park beautification project has progressed in stages over the last 10 years. New bus stops street upgrades, and generally tidy up. 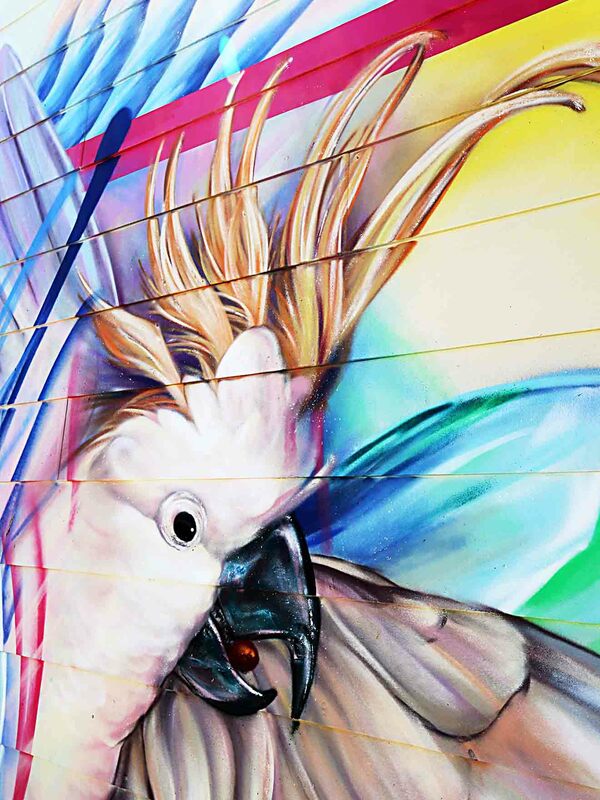 More recently the artworks on the public amenities at the skate and surf parks have added a fun element to the town. 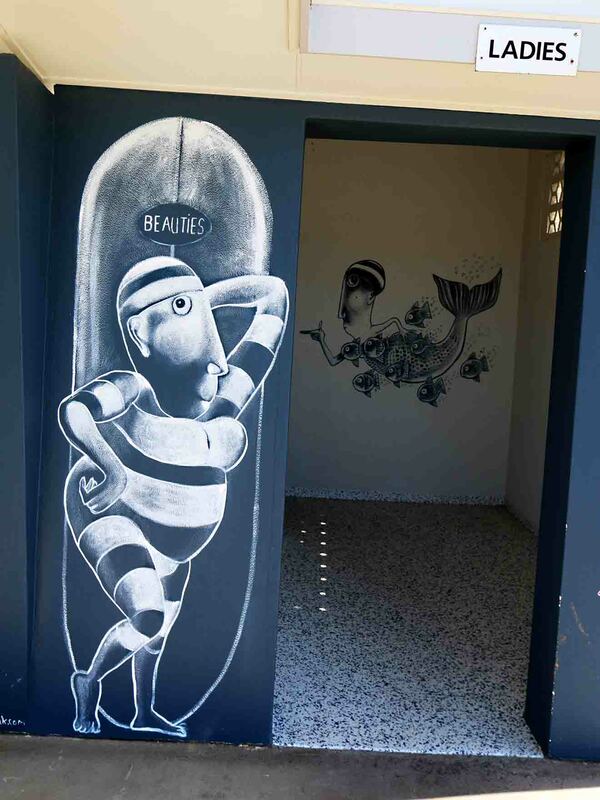 Quirky and unique the imagery is worth the drive just for the chuckle. Directly off the roundabout the corner post office building also sports two giant cockatoos that you can’t miss. 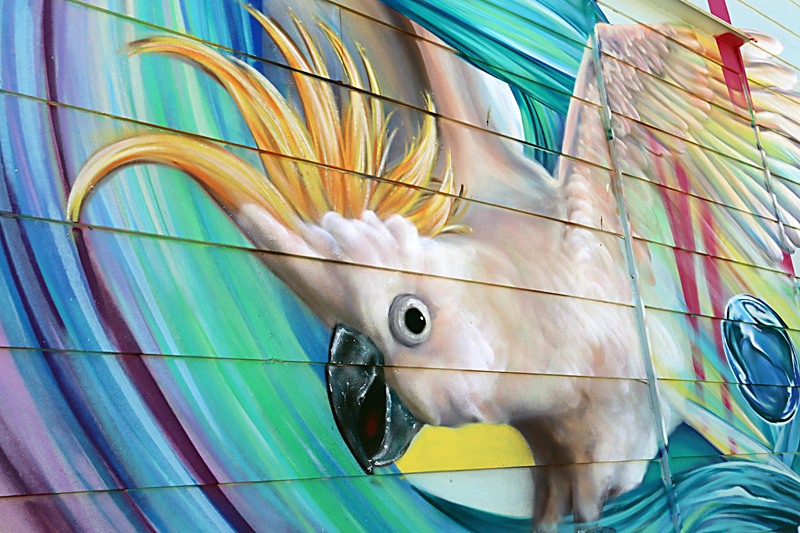 Emu Park also has an art gallery open Wednesday to Sunday. 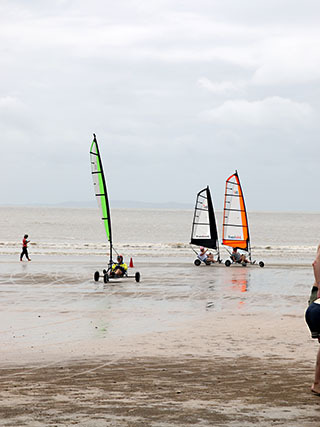 With many beautiful beaches, Emu Park is a fun destination for day trips, beach holidays and all kinds of water sports. Along the sublime coastline are soft sandy beaches for all sizes. Fishermans beach, off Bell Park, is a long sweeping horseshoe that has a long low tide and a tapered out high tide so splashing with the littlies is enjoyable. Fishermans beach is deeper and even gathers wave momentum and is great for the bigger kids and their boogie boards. There are beachside picnic areas perfect for a BBQ or fish and chips. Look out for bin chickens scabbing a feed. Bring your bicycle and pedal on the shared cycling paths all the way from Zilzie to the Haven. Back in 2000, Bicentennial Park in Emu Park had degraded and denuded areas, including a salt scald. Capricorn Coast Landcare Group led a local revegetation project where students, families, groups and politicians got their hands dirty to plant 3,600 trees. The project inspired the formation of the Emu Park Community Bushcare Group, which has gone on to plant 8,000 plants in the area and rehabilitate the lagoon. Thanks to good wet seasons, the lagoon is doing really well and providing good bird watching opportunities too. BBQ facilities beside make it a good spot for a family outing. 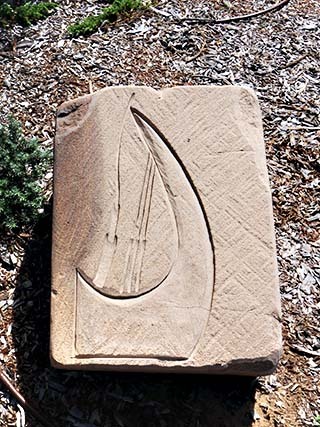 King O’Malley, born in the USA diagnosed with tuberculosis in 1888, was given six months to live, so sailed for Queensland, Australia purportedly with his own lead coffin. It’s said that O’Malley took up residence in a cave at Emu Park where he befriended an aboriginal, Coowonga, who cared for him until he recovered. After walking to Rockhampton with him Coowonga disappeared into the bush and O`Malley never saw him again. Now healthy, O’Malley decided to walk the 2,100 km from Emu Park to Adelaide in South Australia, arriving in 1893. O`Malley went on to become the founder of the Commonwealth Bank of Australia and to conceive the building of the Transcontinental Railway. He was Minister for Home Affairs from 1910 to 1913 and 1915 to 1916, King O’Malley died on December 20th, 1953, at the age of 99 years and 6 months. Want the edge over the competition? 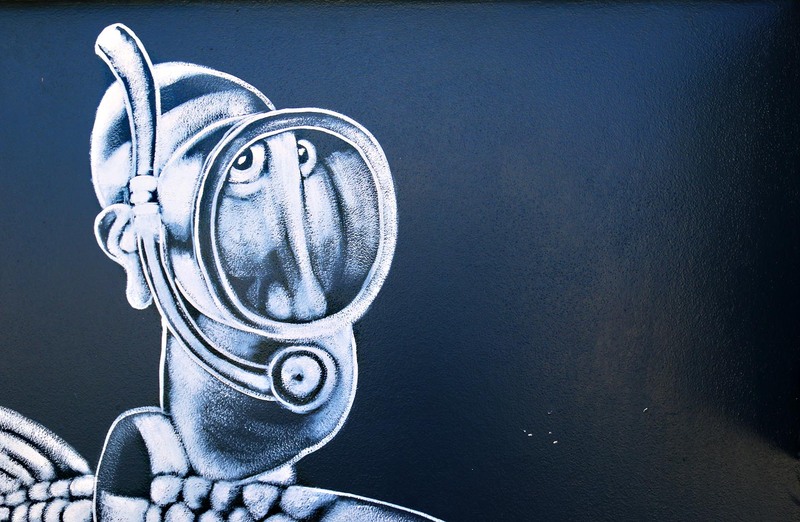 Get infront of your target audience. 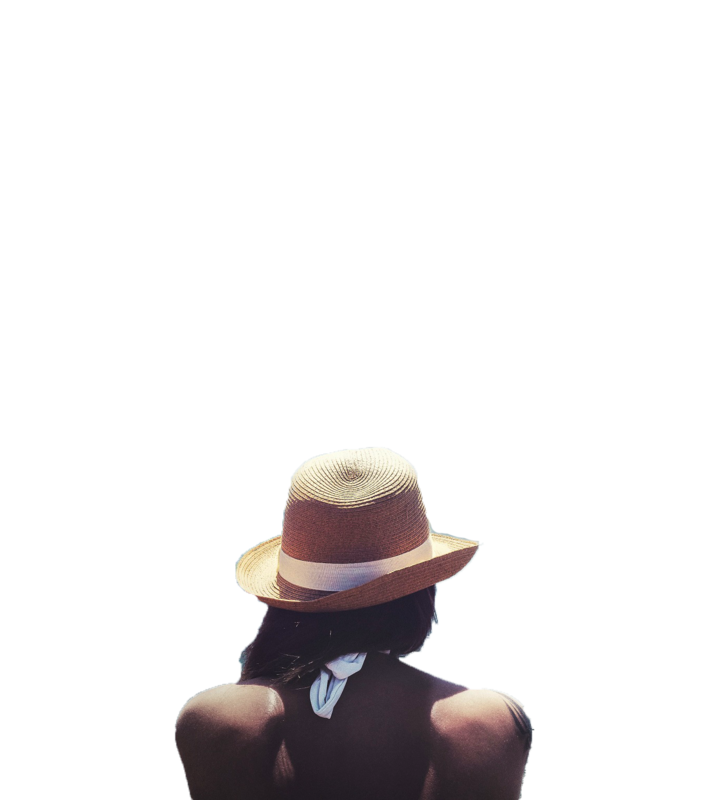 This space could be yours.